Chestnuts date back to prehistoric times and are a good source of starch. Buying: If you are unable to find them fresh, you can take advantage of chestnuts canned, pureed, or preserved in sugar or syrup (marrons glacés). Some specialty markets also carry frozen shelled and peeled Italian chestnuts. Canned chestnuts can be either sweetened or unsweetened and are usually imported from France, making them a bit pricey. Procuring: Harvested from October through March, December is the prime month for fresh chestnuts. Although they are wonderful straight from the oven or fireplace, you can make use of the winter chestnut crop in many ways, both sweet and savory.To boil, cover with cold water, bring to a boil, and simmer for three minutes. Remove from heat. Scoop out a few at a time and peel off the shell and skin with a sharp knife. As they cool, they become more difficult to peel, so keep them in hot water until you are ready to peel. Proceed with your recipe using the peeled nuts, making sure you finish cooking them completely within your recipe. Fresh chestnuts will dry out easily, so keep them in a cool, dry place, free of drafts, and use within 1 week. Fresh nuts in the shell can be placed in a perforated plastic bag and stored in the crisper drawer of the refrigerator up to 1 month, depending on the freshness factor when you purchase them. Fresh chestnuts can be frozen whole in their shells up to 4 months. in Europe, Asia and Africa, chestnuts are often used as an everyday potato substitute.Today, most of the chestnut food crop is imported from Japan, China, Spain, and Italy. Chestnuts are known as marrons in France and some parts of Europe.Chestnuts contain twice as much starch as potatoes. It is no wonder they are still an important food crop in China, Japan, and southern Europe where they are often ground into a meal for breadmaking, thus giving rise to the nickname of "bread tree." History: Probably one of the first foods eaten by man, the chestnut dates back to prehistoric times. The chestnut tree, Castanea sativa, was first introduced to Europe via Greece. 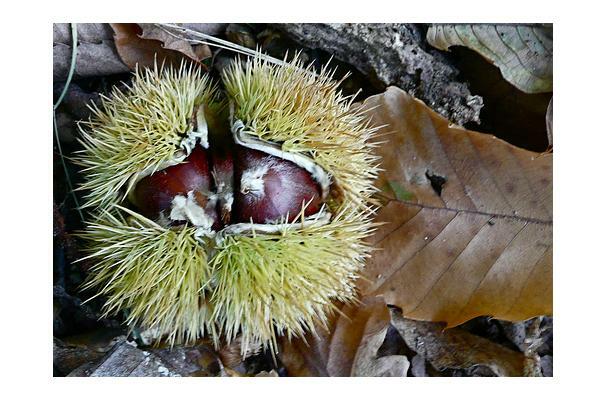 The majority of the chestnut trees currently found in America are of native European stock, but Native Americans feasted on America's own variety, Castanea dentata, long before European immigrants introduced their stock to America. In 1904, diseased Asian chestnut trees planted on Long Island, New York carried a fungus hitchiker that nearly devasted the American chestnut population, leaving only a few groves in California and the Pacific Northwest to escape the blight.